This is a really good, solid glove in excellent condition. I'm thinking this glove is from the 50's or 60's. MODEL NUMBER A2192(LH VERSION OF A2190), SOLID GLOVE, WELL CONSTRUCTION WITH LEATHER PIPING ETC. NICE LINING AND EXCELLENT WILSON CLOTH PATCH. MADE IN USA, CATALOGED FROM 1955-1959. FOR DISPLAY ONLY. The autograph of Ted Williams is very faint. Photos of actual item. As the photo's show this glove is in aged but good condition. I don't see any missing lacing or trim. This item appears to be still useable. Right Hand Throw. Kruk Cards specializes in buying large accumulations and complete inventories. We will buy everything from singles to complete sets to cases to graded cards to commons. We are always buying collections! There is some damage on the top of the mitt and a kids signature.. which I think just add to this mitts story. You can just see it being used in a sandlot in the 50’s. Great mitt, awesome piece. Player: Al Kaline. Condition: NM (MK). Leather is supple, retains nice color, and shows very minimal wear. All lacing is intact and appears original. No mars and the glove has not been oiled. Right Hand Throw. Works good. No seen flaws. It is broken in and well oiled. A nice collectable. There should be no worries at all. Ships priority mail. Needs a good home - someone who can give it some TLC and or take care of it better than I can. Noticable wear such as a name written on the leather, darkening of the palm, and some general leather wear. See pictures. Fielders glove w/ bold replica signature along inside pinky area. ". Vintage Used Wilson "Ball Hawk" Baseball Mitt (A2283) - Al Kaline endorsed. This is a Wilson model A2283 in decent condition. It is a left-handers glove (worn on right hand). It shows Al’s facsimile signature on the last finger (very clear). Wilson A2130 Antique Baseball Mit. Bill Tuttle Edition. Gloves show obvious wear and cracking from its age. It also looks like a piece of rope has been used to replace original leather finger lacing. 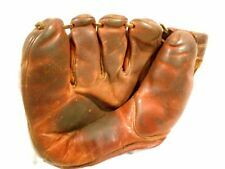 Vintage Wilson AD94G Ball Hawk Clem Labine baseball glove with grip-tite pocket. Unsure of manufacture year. Is in good condition with wear from age. Has someone's name written in permanent marker on one side. Measures 8.5" tall by 6.5" wide at the wrist. See all photos. I didn't treat it due to peoples product preferences for gloves. I do not know much about the mitt except that it does have wear. The patent number is too worn the "Two Fingers Here" area to read. All that legible is "Two Fingers Here" and the first two numbers of serial number "22" and Canada. Leather inside of glove is work & torn. Wilson Model A2970. Nice distressed leather. #A2145 Pete Runnels Ball Hawk. Condition Details: In used, distressed condition. Has a nice, aged and distressed look from wear. Sold as is. See pictures for details. Wilson number A2936. Fielder glove for a left handed thrower. Great vintage find! Roy McMillan Ball Hawk glove. Has some wear and scuffs as it is vintage. This Glove is a Left Hand Throw Model and features a Grip-Tite Pocket and Snap Action. It is marked Made In USA. This is a hard to find glove that would make a great addition to your collection! Here is your chance to get ahold of one! The glove has a great classic look. The glove is a must have for your wardrobe. Kruk Cards specializes in buying large accumulations and complete inventories. We will buy everything from singles to complete sets to cases to graded cards to commons. We are always buying collections! Very nice piece. Needs cleaned and polished. What you see is what you will receive. RON SANTO rides again just like he did in the 1960's & 70"s. I was a Detroit Tigers fan then but i loved Ron Santo. Who didn't?. I don't think I've ever seen a baseball glove with this many markings. This is a left handed glove. Enjoy Wilson A 2171 Al Kaline Leather Baseball Glove Ball Hawk. Please see all details everything is as though. Sold as is. Shipped with USPS Priority Mail. Very nice Baseball/softball glove Ron Santo Autograph Model Wilson A2164 Made in the USA. Ball Hawk Snap Action Nylon Stitched. RON SANTO- Played for to Chicago Cub's 1960-1973 Third Base. 1331 RBI (98). Fair used condition. Color shades may be slightly different than photo. Professional Model Ball Hawk glove mitt. VERY RARE GLOVE! ---This Baseball Glove is in Used Condition. Total Length-. Sleeve Length-. Shoulder to Shoulder-. Waist (all the way around)-. Wilson Harvey Kuenn model A2234 baseball glove. There is some fading to the writing on the glove. There are a couple of places where the string is broke as you can tell from the photos. There is also a faint area where someone wrote a name next to the thumb hole. If you have any questions please feel free to ask and I will do my best to help. Thanks for looking!